both colors as you crochet the first new color row. but I would never be one to say "I told you so" ;-). the new color through both loops for a seamless color transition. Explained with greater detail in photo tutorial below. so in other words, on Tuesday night after two evenings of watching DWTS, one strip is complete. And that strip will forever, in my mind be, the Foxtrot, or the Tango or the Jitterbug etc. keeping in mind that this is a labor of love. of one color way before the other colors, unless you want to save a color for the edging. I also made sure that I did not repeat a color right next to the same color on the next strip. This will take a little tracking. Sometimes I would make two random strips with no rhyme or reason to the color order and then a third one that could fit between the two, making sure the colors would separate any two colors next to each other. Pull out those supplies you gathered last week. repeat with two loops to the end until you have one loop left on hook. to frog and fix. 10 is easy to count, 3,3,3, and 1 is what I push with my fingers. That's the beauty of Tunisian. but leave the last two loops on the hook for the color change. Grab the new color of yarn and leave a tail a little longer than the width of the crochet. Slip the new color through the last two loops from your last row. (the old color and the new color) in front and behind this row as you crochet. it will be a piece of cake after that. Here are a few more photos of what the looks like. and this is how it will look from the back. See how nicely the new color works in. Leave these ends as they can be secured further with the joining crochet row. I originally snipped these because I felt like they were already secure enough, but upon washing they worked themselves out a little, so now I am thinking that they could be worked in with the join row next week, as well. On the last row leave only one loop left on the hook. Insert hook in second vertical yarn line and YO and pull through both the loops. 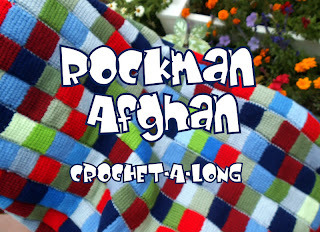 Make 16-20 of these strips for an afghan. If you are not up to such a big project then this patchwork concept can be made in to a baby blanket, a pillow, a scarf or even a stuffed animal...the possibilities are endless. and it's made exactly the same as the afghan, just less squares. 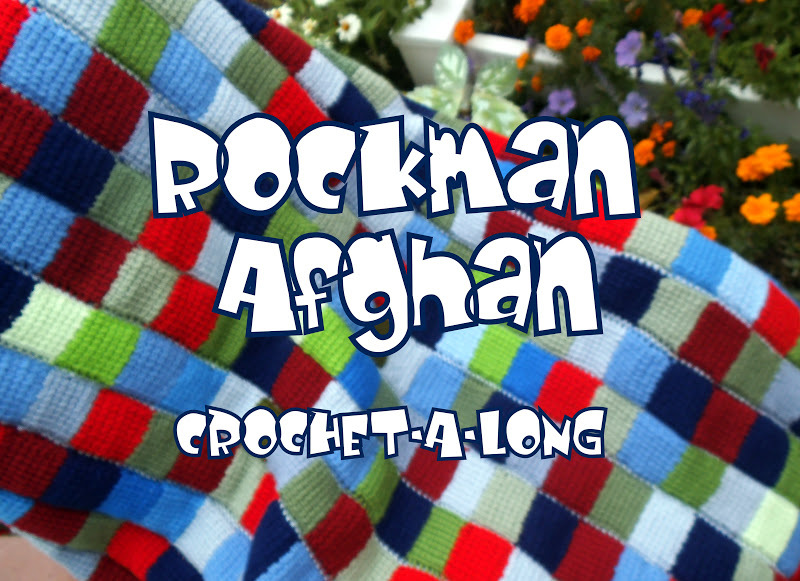 The Rockman CAL does not need to be an afghan or a potholder, for that matter. See the side bar for week-by-week instructions. See you Tuesday for the next step!